schedule below for more detailed information. e-books, and more - all from one search box. The new Journal Finder includes improved searching and easier navigation. by the library, regardless of the publisher. - December 28, 2015: Journal Finder will be unavailable. as we transition to the new QuickSearch. introducing these upgrades to improve online access to library resources. Special Collections & Archives just completed the digitization of three Loyola promotional films from the 50s and 70s and put them up the Louisiana Digital Library. Stay tuned for more movies from Special Collections & Archives, and let us know what you think of these. How much has campus and student life changed? 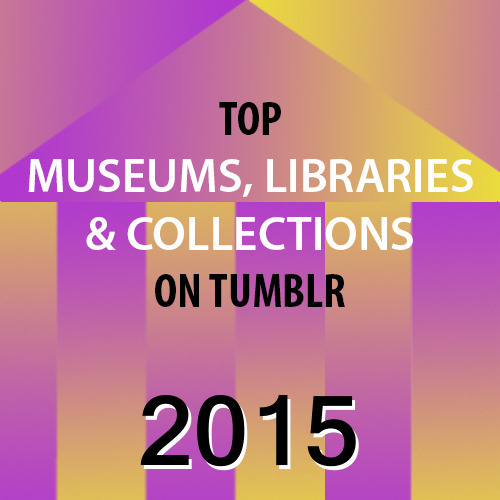 The Hagley Museum and Library in Delaware included the Monroe Library Special Collections & Archives in its 2015 list of top museums, libraries, and collections on Tumblr. Their list was inspired by lists put together by the University of Reading Museums and Collections, the Othmer Library of Chemical History, the Decker Library at Maryland Institute College of Art (MICA), and Harvard Divinity School’s Historical Collections and Manuscripts and Archives. Read the post to see some other amazing cultural heritage institutions using Tumblr, and check us out while you’re at it! New test preparation guides at the Monroe Library! In cooperation with the Student Success Center, test preparation guides for the Dental Admission Test (DAT), Graduate Record Exam (GRE) and the Medical College Admission Test (MCAT) are now available for you in the Monroe Library. All guides are at the front Learning Commons Desk shelved with the books on reserve under “Test Prep”. They can be checked out for four hours with your Loyola ID. We will be adding more guides for more tests in the near future. Also, don’t forget the Learning Express Library 3 with online tests for many admissions tests, occupational tests, TOEFL, and skill improvement tutorials. Individual registration is required to use this service. 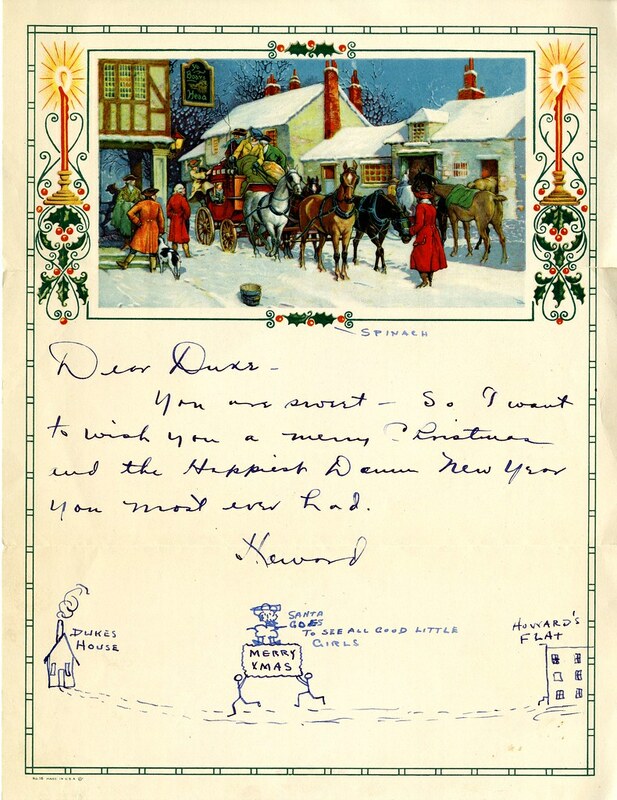 Today we offer you a Christmas Letter we came across in our Anthony J. Stanonis Collection. The Anthony J. Stanonis Collection contains correspondence, daily calendars, diaries, journals, pocket notebooks, photograph albums and scrapbooks related to travel, tourism and daily life as recorded by the creators of the items. Albums and scrapbooks related to travel cover regional and cross-country trips in the United States, the Caribbean, and Europe by automobile, train, plane and boat. The date range of the collection spans from 1890 to 1987, but the bulk of the traveling ranges from the 1930s to the 1960s. All items were bought by Anthony J. Stanonis from eBay for academic research related to travel and tourism. You are sweet. So I want to wish you a Merry Christmas and the Happiest Damn New year you most ever had. To look at this and other letters, scrapbooks, and travel diaries from the Stanonis Collection please visit the Special Collections and Archives Booth-Bricker Reading Room, Monday-Friday from 9:00-4:30. 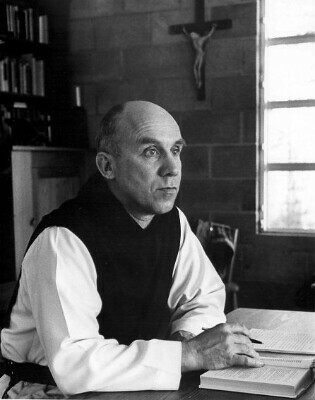 Today is the 47th anniversary of the death of religious writer, social activist, and Trappist monk, Thomas Merton. 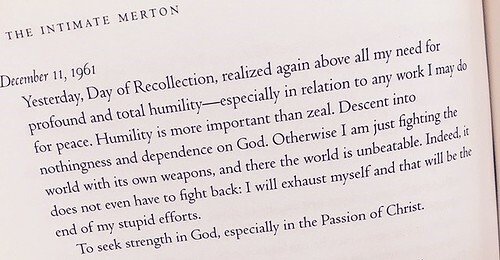 The intimate Merton : his life from his journals 1st pbk. ed. Merton (January 31, 1915 – December 10, 1968) wrote on both Eastern and Western religious thought as well as meditations, journals, and essays on social justice and peace. He is considered one of the most important spiritual writers of the 20th Century. Merton’s best-known book is The Seven Storey Mountain, an autobiography about his childhood and subsequent conversion to Catholicism at age 23. Edited my Robert Giroux, this book went on to become a best seller with all Merton’s earnings going to the Gethsemani monastery in New Haven, Kentucky due to his vow of poverty upon entering the order. 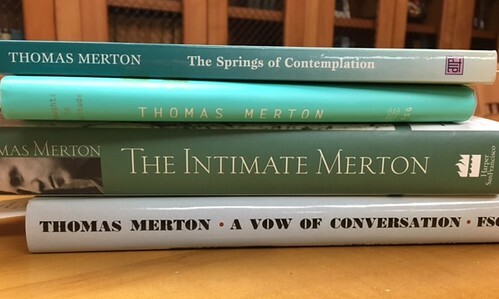 Please follow this LINK to look at all the volumes by and about Thomas Merton as included in our Robert Giroux Book Collection. For an extensive bio on Merton please follow this LINK to the excellent one located at the Poetry Foundation. This collection is available for research in the Special Collections and Archives Booth-Bricker Reading Room, Monday-Friday from 9:00-4:30. At some point in the holiday season one is sure to come across some sort of adaptation of Charles Dickens’ A Christmas Carol. The definitive Christmas story has not only inspired numerous adaptations, but has also been influential on other works including It’s A Wonderful Life and The Grinch That Stole Christmas. 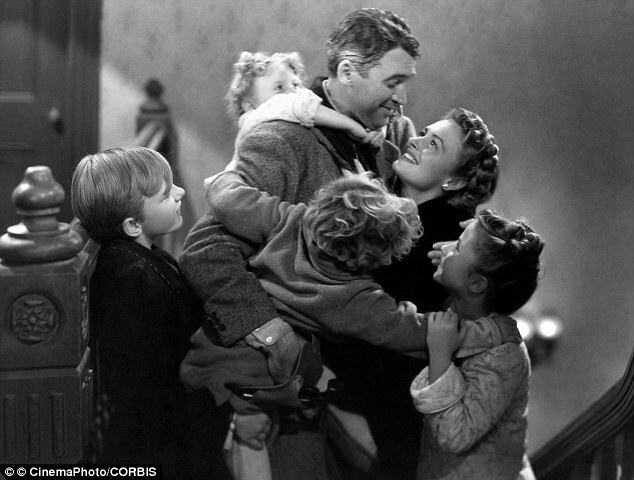 It's A Wonderful Life, CORBIS. How The Grinch Stole Christmas, TV Guide. If you find yourself wanting to read the novella for yourself this year, we have wonderfully luxurious copy here in library’s Special Collections and Archives. 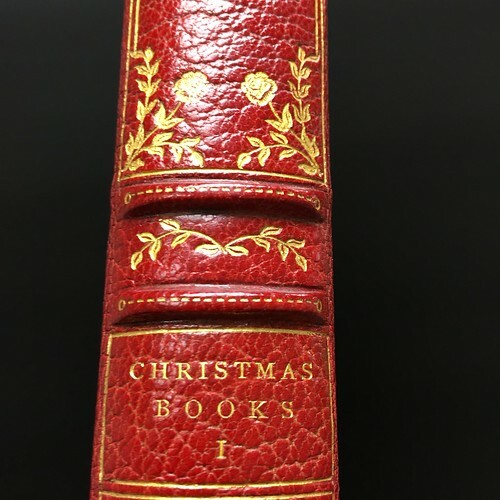 A Christmas Carol can be found in Christmas Books, Volume I as part of our 64 volume fine press edition Works of Charles Dickens. There were only 10 copies of this set created in 1900, with this set being bound especially for J. Alice Maxwell of Rockville, Connecticut. 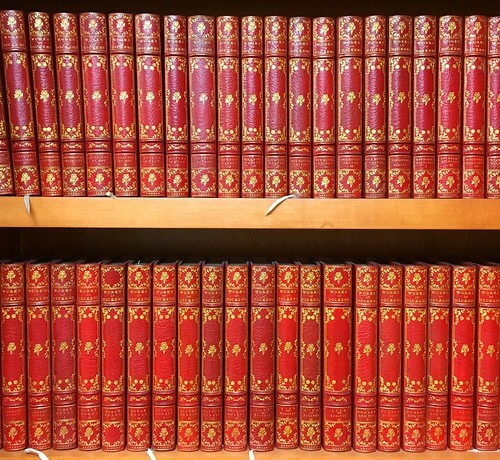 All 64 volumes are encased in full red morocco leather with gilt edges, three raised bands on the spine, gold lettering and gold floral tooling. 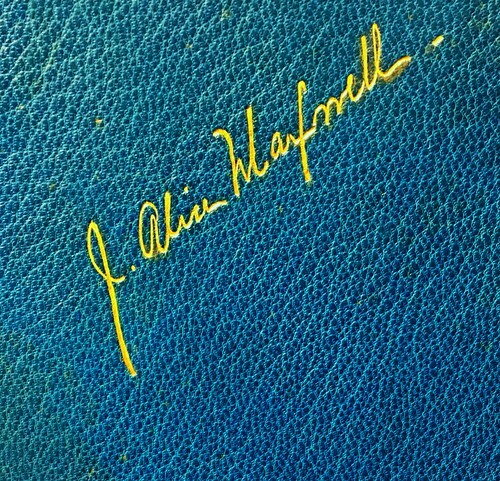 The set looks rather festive just sitting on the shelf, but once you open the volumes the extravagance continues with front and rear covers bound in red and blue morocco leather and matching leather end papers personalized with J. Alice Maxwell’s signature stamped in gold. The volumes are heavily illustrated with photogravures, facsimiles, etchings, and original watercolors. 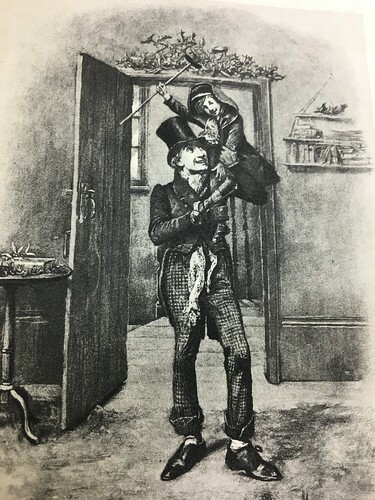 Works of Charles Dickens, photogravure by Fredrick Barnard, Bob Cratchit and Tiny Tim. 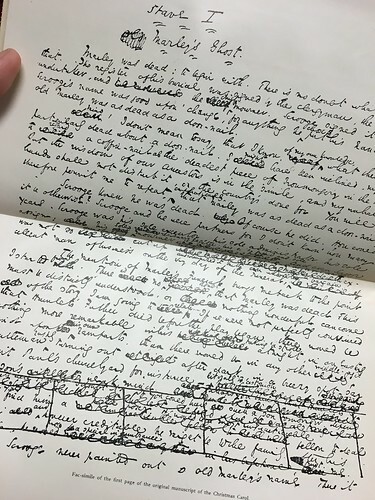 Works of Charles Dickens, facsimile of the first page of the original manuscript. 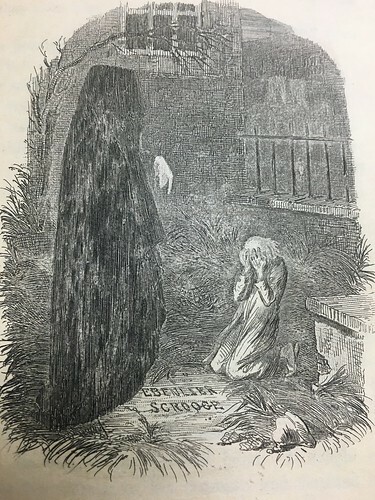 Works of Charles Dickens, etching by John Leech, The Last of The Spirits. 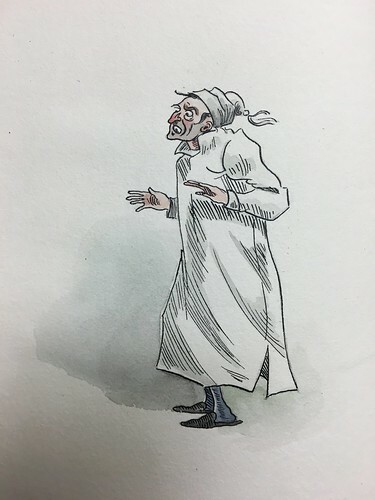 Works of Charles Dickens, watercolor, Scrouge. The watercolors are of particular interest since they are actual watercolors bound into the volumes. 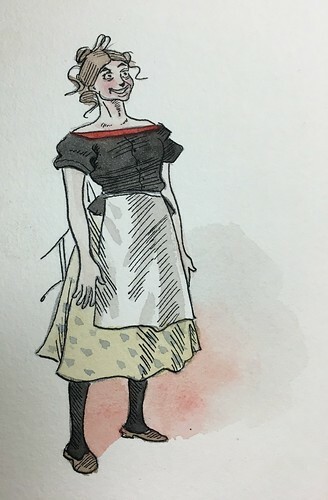 Works of Charles Dickens, watercolor, Tilly Slowboy from The Cricket On The Hearth. 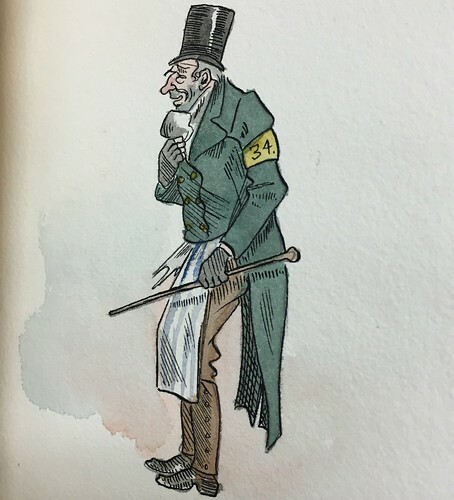 Works of Charles Dickens, watercolor, Trotty Veck from The Chimes. Please feel free to come and see this amazing turn of the century example of limited edition fine press publishing in the Special Collections and Archives Booth-Bricker Reading Room, Monday-Friday from 9:00 to 4:30 pm. Today in Found in the Archives we take a look at An Account of the Newsboys’ Home, New Orleans, LA. 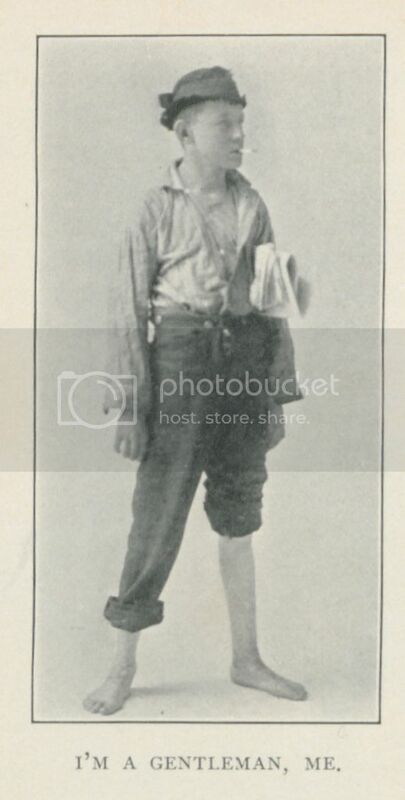 The small pamphlet, available in Special Collections and Archives and online at the Louisiana Digital Library, details the life of the some of the young boys working on the streets on New Orleans in the late nineteenth century. Rev. Porta described a well appointed refuge for the children, managed by the Sisters of Mercy and located at what is now 324 Picayune Place. 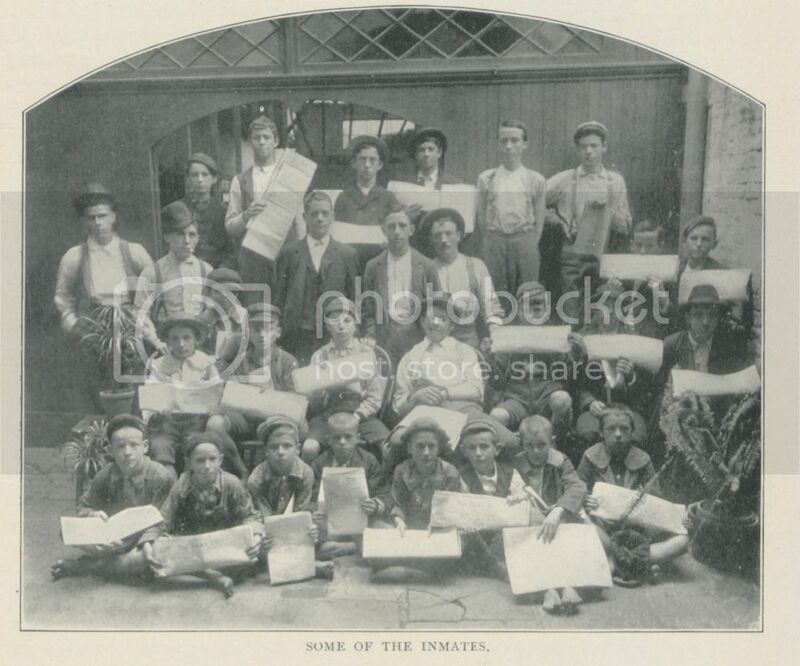 Featuring a “beautiful” chapel, large gymnasium, clean kitchen and tidy dormitories, the home provided to the newsboys also offered two hours a day of schooling. 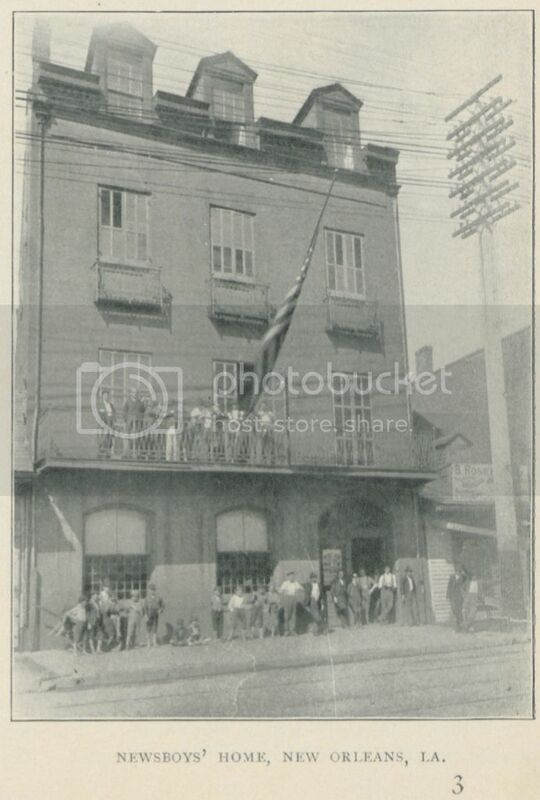 The Newsboys’ Home closed it’s doors in 1917, but you can read the account anytime at the Louisiana Digital Library or in person in Special Collections & Archives. Located on the third floor of Monroe Library, we are open for research and quiet study Monday-Friday, 9:00-4:30. Sometime in 1927 Lou Wylie submitted a poem to The American Mercury, a leading journal of letters and opinion. On September 26, 1927 H. L. Mencken, editor of that magazine, wrote Wylie that her poem had been accepted and would appear in a forthcoming issue. Thus began a correspondence between the two that lasted over twenty years. The H.L. 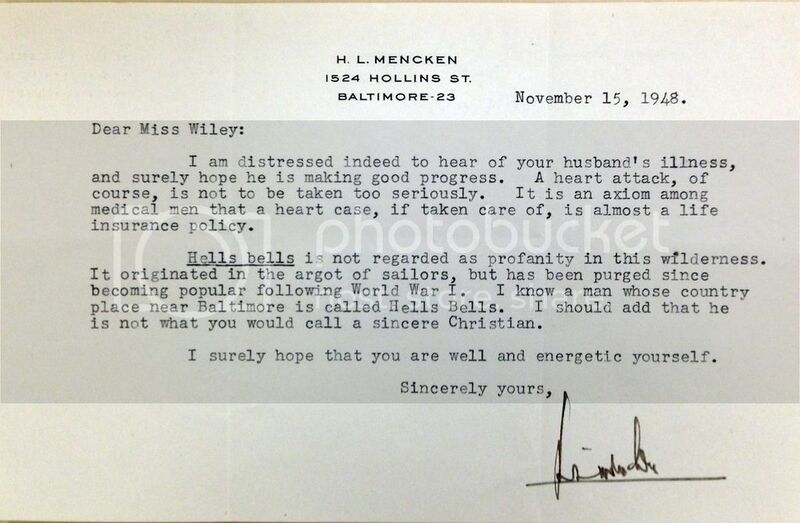 Mencken Letters collection preserves one side of that exchange–the letters written to Wylie by Mencken. Wylie must have been flattered by Mencken’s interest, for by 1927 he had established himself as one of the nation’s leading writers. Born in Baltimore in 1880, he began his career in 1899 as a police reporter on one of the local newspapers. His subsequent labors on one or another of the Baltimore dailies–as reporter, columnist, or editor–won him recognition as a talented and prolific journalist. In 1924 he helped found The American Mercury and served as its editor from 1924 to 1933. In addition, he found time to write many books, including The American Language, an important study of the English language in the U.S. This prodigious output was marked by Mencken’s aggressive iconoclasm and by his gift for invective; he was a formidable polemicist whose combative prose mocked the sacred and the conventional in American social, political, and literary life. But whatever the attractions of New Orleans, in 1928 Wylie moved to New York City, where she worked as a journalist and publicist. At some point she married–Mencken began to address her as Mrs. Van Sicklen in 1941–though that union apparently dissolved in 1949. About 1941 she returned to New Orleans, where she handled publicity for Pan American Airways. Over the years she maintained her literary ambitions, but her accomplishments were apparently modest. 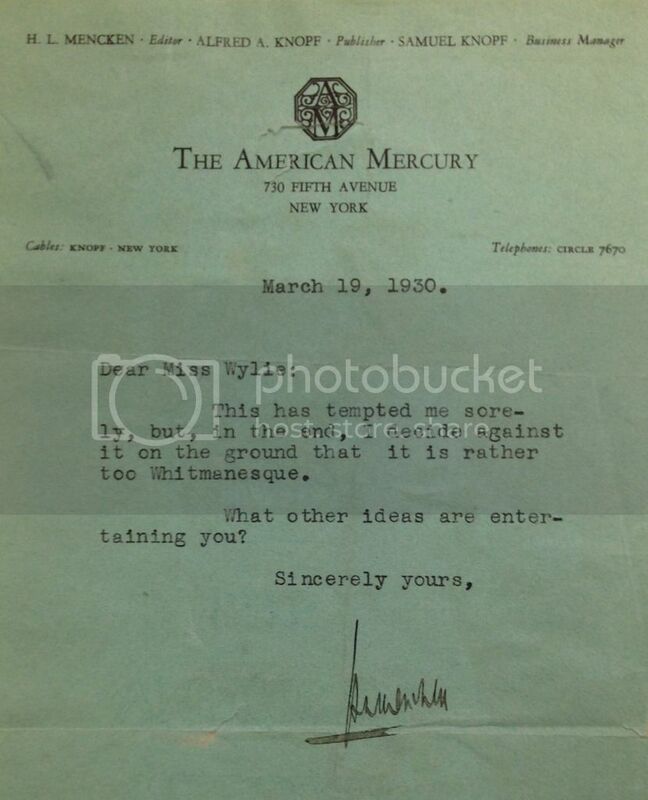 During Mencken’s tenure as editor, however, The American Mercury did publish at least two of her writings–the poem “Psalms of Love” appeared in the January 1928 issue; and the short story “Dance-Hall Lady” appeared in the July 1933 issue. 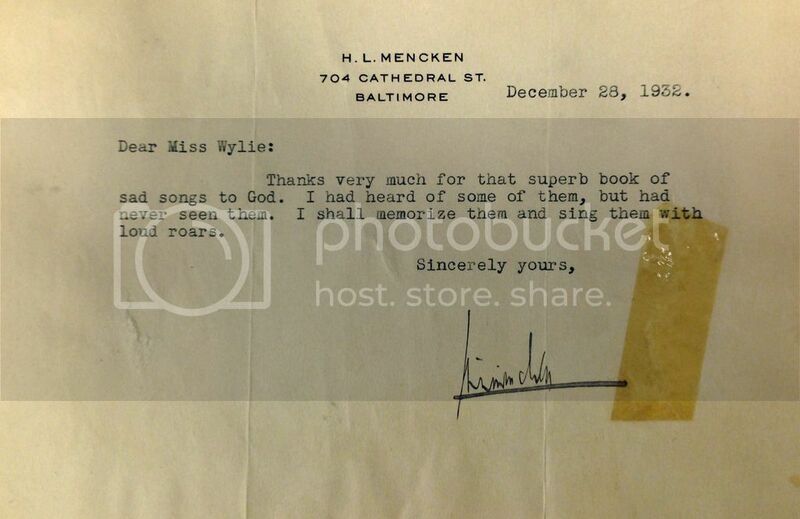 The relationship between Mencken and Wylie was confined to correspondence; the two never met. Mencken’s letters to her were, in general, brief notes” usually no more than a 3 couple of short paragraphs. In them he often encouraged her literary efforts and suggested publications to which she might submit material, and he often commented with mordant humor on topics as varied as publishing, literature, politics, religion, and his own health. His last letter to her was dated November 15, 1948. Come and meet H.L. Mencken through his words in Special Collections & Archives, located on the third floor of Monroe Library, Monday-Friday, 9:00-4:30. You are currently browsing the Library Lagniappe blog archives for December, 2015.